All Lesro frames and assemblies are warranted against defects in materials and workmanship for the life of the product. Includes the Matrex seat support system for life long comfort. It is our pleasure to provide you with high quality products. We stand behind the craftsmanship of our products and accordingly guarantee our work with the following warranty. For Lesro to assist you in a timely manner, we request that you inspect the product you have ordered thoroughly for defects, damage and/or missing hardware or components immediately upon receipt. We also suggest that you retain a record of purchase, such as a sales receipt, and the accompanying shipping paperwork. This warranty is applicable solely between Lesro and you, the original purchaser. The warranty guarantees that the product you have purchased and all of its components are void of defects in material or craftsmanship. "Defects" are defined as any imperfection which may impair the proper use of the product. This warranty is applicable only under conditions of normal use. The warranty does not cover defects caused by improper assembly or dis-assembly, defects occurring after purchase due to; product modification, intentional damage, accident, misuse, abuse or negligence, cosmetic damage, labor or assembly costs. All Lesro frames and assemblies are warranted against defects in materials and workmanship for the life of the product. Fabric and vinyl covering is warranted for 2 years from date of shipment. 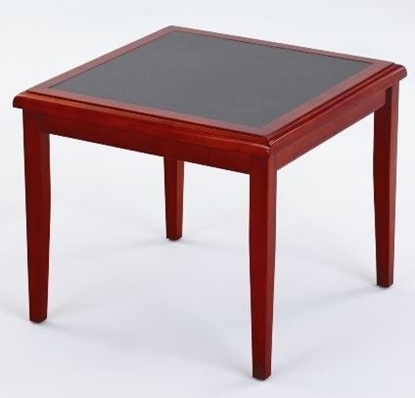 A good choice for your waiting room or private office, this Lesro Brewster Corner Table will look and function well. Available in 6 wood finishes, this table compliments most any modern chair design. This Siena Series sofa table has tempered glass for durability and safety. The Lesro's simple and elegant styling are perfect for a waiting room or office lounge. A solid hardwood constructed waiting room chair with table combination unit. A good space saving piece in your reception area. These chairs feature Matrex seat support for life long comfort and a connecting table for reading materials or drinks.